Salade parisienne is a variable “salade composée”, what is known in American cuisine as a “chef’s salad” or “composed salad”. The ingredients are seasonal and can vary, depending on what you have in your pantry at the time. It’s perfect for “clean out your refrigerator” night, especially when you don’t have anything special planned for lunch or dinner. Typically when I make this dish, it’s in the summer or autumn, so I can take advantage of the wonderful profusion of vegetables that are available at our local farmers’ markets. To me, the stars of the show will always be the vegetable accompaniments as proteins tend to be boring — either leftover roast chicken, or perhaps sliced roast beef, or good-quality canned tuna packed in olive oil. Vegetables in a salade parisienne are what makes it come alive, especially in this winter version. You may have to think creatively, if you are (as I am) currently in the tail end of winter — or as I sometimes call it, “the season that time forgot”. If this were summer, for example, there might appear blanched green beans, sliced tomatoes, steamed new potatoes lightly dressed in an herb vinaigrette or cauliflower crudités with a garlic aioli. If it were autumn, I might serve roasted peppers, deep-fried eggplant, puréed pumpkin or perhaps a tangle of sautéed wild mushrooms. It being the depths of winter, accompaniments might range from shaved fennel lightly dressed with lemon juice, to a leek gratin, to julienned salsify that was briefly sautéed in unsalted French butter. This is a less ambitious plate than what I was going to attempt initially. Originally, I was going to have a plate of roasted fingerling potatoes, perhaps some fennel braised in French butter and wine, and a side of roasted grapes. All that changed when I stumbled upon the idea of pairing roasted grapes with pancetta, the results of which you see in this post. The olives were marinated in a mixture of preserved lemons, olive oil, herbs and garlic. Substitute regular mixed pitted olives instead, if you like. Roasted vegetables are one of the easiest preps you’ll find on this food blog, but as with so many recipes, much depends on the right amount of seasoning — in this case, a judicious use of salt and pepper. Chop your vegetables into proportionally-sized pieces. This will ensure that they all cook evenly at more or less the same rate. Toss with the cooking fat of your choice (I use olive oil most of the time; however, in this case, it was rendered duck fat) and a generous amount of salt and pepper. Regarding the salt, it’s difficult for me to give a precise estimate. I now understand what my mother means when she says “when it looks right”; it’s the kind of measurement that good cooks tend to develop when they’ve been cooking for a long time. About 1/4 teaspoon of salt sounds about right (and about half that amount of black pepper), although you may want to adjust those quantities depending on your preferences. Place vegetables into a roasting pan or Pyrex baking dish, then roast in a pre-heated oven at 350 F for 45 minutes. Place mustard in a small bowl. Whisk in boiling water, drop by drop. Then whisk in olive oil, by droplets at first, then in thin continuous stream or until the sauce becomes emulsified. Whisk in lemon juice and herbs. You can use an immersion blender if you wish, although I recommend the manual method so you can get a sense of how thick the sauce should be. Taste for salt and pepper, then use at once. Note that this recipe is a slightly tweaked version of Katrina’s recipe for the moutarde dressing. Arrange the various elements attractively on a plate. Spoon some sauce moutarde atop vegetables, or in the case of the picture above, slices of roast chicken. Serve at once. 07 Mar	This entry was published on March 7, 2012 at 2:58 pm. It’s filed under food, food photography, French food, general, winter and tagged carrots, chicken, dinner, food photography, gluten-free, potatoes, salad, turnips, vegetables. Bookmark the permalink. Follow any comments here with the RSS feed for this post. This is my kind of plate. Your egg and chicken look perfectly tender, and the veggies roasted to perfection. Yum! And the mustard sauce must bring it all together nicely. Thanks for your recent comment about using kumquat in soup. So interesting! 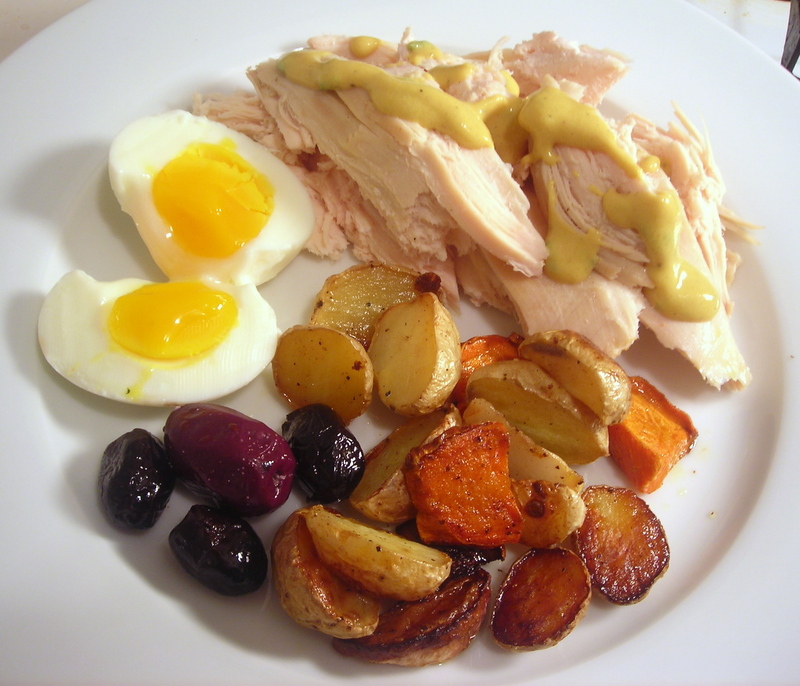 Those yolks are really that yellow — courtesy of eggs from Quattro’s Game Farm. Yum. Looking forward to cleaning out my pantry and making a salade parisienne this week. With a fancy name it doesn’t sound as bad as the leftovers. I haven’t said in a while how much I enjoy your blog. You make the simplest of fares seem a delight. Food isn’t just fuel but something marvelous.